Yeh Hai Mohabbatein 11th July 2016: Nidhi argued with Ishita and Raman that Ruhi was going to stay with her. Ishita begged Ruhi to change her decision. Ruhi asked her to stop her drama as she did not trusted them anymore. She told everyone that she knew Romi was not staying there and he wanted to go back to his home. Ruhi said she wanted to know how much reality was there in their emotions. She further said that she would stay with them forever if Raman gets married to Ishita. Everyone was shocked, Nidhi asked her to stop behaving like a kid as she knew very well that Bhalla’s were over dramatic. Ruhi did not listen to her words. She said to Raman if he would marry Ishita. Shagun gets sad hearing that and left from there. Nidhi shouted on Ruhi to stop changing her decision and asked her to pack her bags as they would leave for Australia. Raman agreed and replied back to Ruhi that he could do anything for her. He said that he could marry Ishita if by doing that, Ruhi could come back home. Nidhi and Ashok were shocked to hear that. Nidhi asked Ishita how she could do that. Ishita said she could do anything to get Ruhi back as she could not see her in the hell again. Nidhi shouted on all of them that she would never let Ruhi come back to them. Ishita asked her to leave. Adi took Ruhi from there. Nidhi taunted Ishita that she knew how much value Raman had in his life for her. Ishita said to her to mind her own business and leave from there. Nidhi kept shouting on Ishita and raised hand on her. Romi came in between and asked Nidhi to be in her limits. He asked Ashok to take Nidhi away from there as he would forgot all his business deals as he could not see anyone insulting her Ishita bhabhi. Raman and Ishita and Shagun discussed about marriage issue. Shagun said she had no problem with their marriage. Even if Raman married her, they would never live in happy life as Raman and Ishita are made for each other. Ashok and Nidhi planned to get Ruhi back to them. Nidhi planned to kidnap Ruhi. 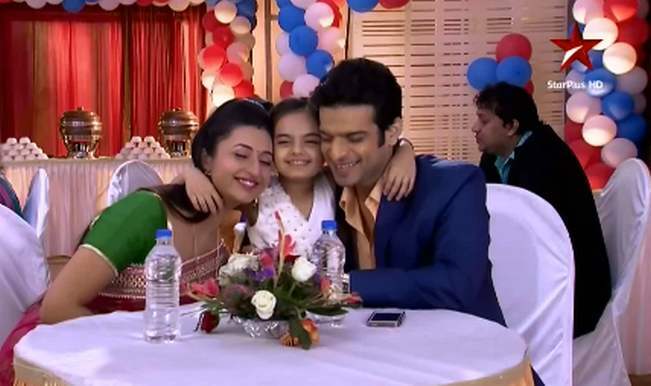 Stay Tuned to Reporter Times for more updates on Yeh Hai Mohabbatein .